Please contact our Sales Department at (888) 986-4466 or Sales@SierraMadreCollection.com for more details, to check availability or to purchase any item. Limited to 2,013 copies. Engineering drawing of a 1963 model Porsche along with a photograph of a structurally similar car. Infinite scrolling calendar. Dimensions: 43.5 x 33.5 x 2.5 cm. Side slits. Back slightly longer than front. Side slits, placket, shoulder seam and neckband in contrasting colours. 918 Spyder logo on the chest, 918 and Porsche logos on the sleeves. 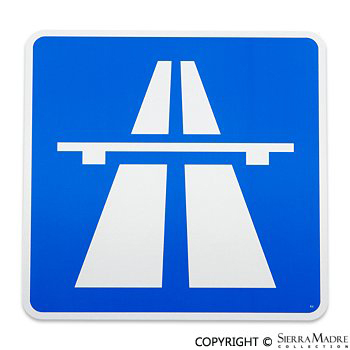 The Autobahn sign is one of the most recognized signs in world. 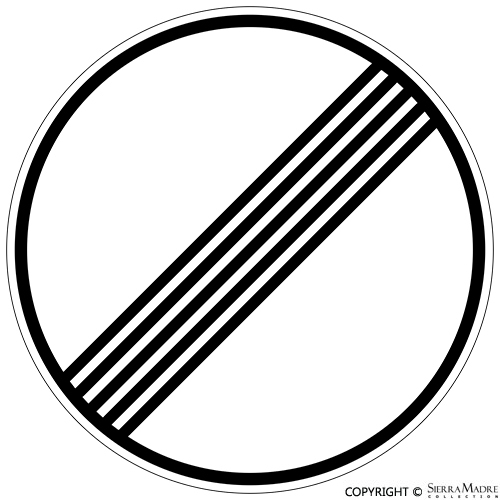 Posted on the Autobahn entrance ramps and indicates that Autobahn traffic regulation begin. Add a distinctive look to your Boxster with these genuine license plate frames. Available in three finishes! 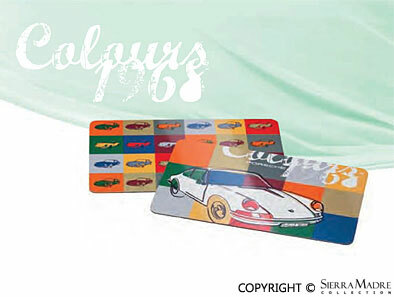 Add a distinctive look to your Carrera with these genuine license plate frames. Available in three finishes! Add a distinctive look to your Cayenne with these Genuine license plate frames. 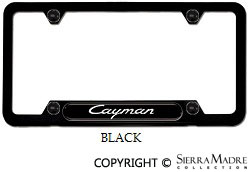 CURRENTLY UNAVAILABLE Add a distinctive look to your Cayman with these genuine license plate frames. Available in two finishes! 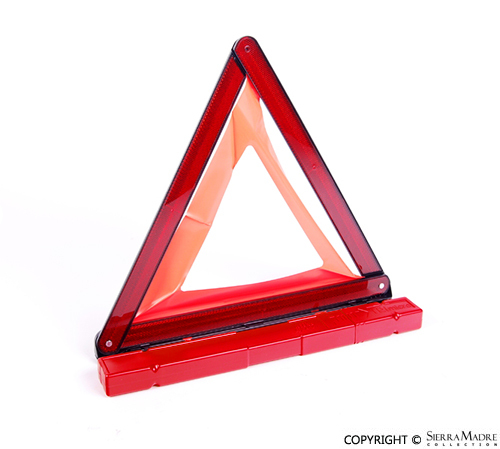 This foldable emergency warning triangle from can be used with all models. 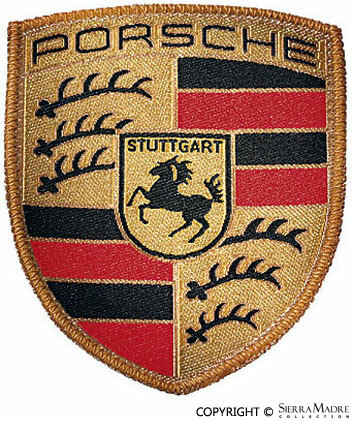 Sew on badge with Porsche® Crest. Dimensions: 2 x 2 1/2 inches. 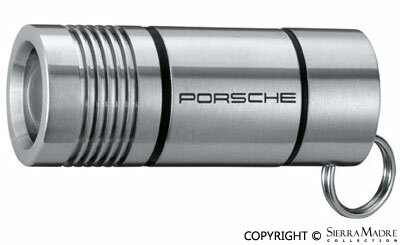 Metal pin with Porsche® Crest. 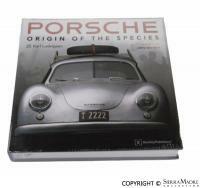 CURRENTLY UNAVAILABLE The Porsche flat-six engine and the cars it powers are legendary. 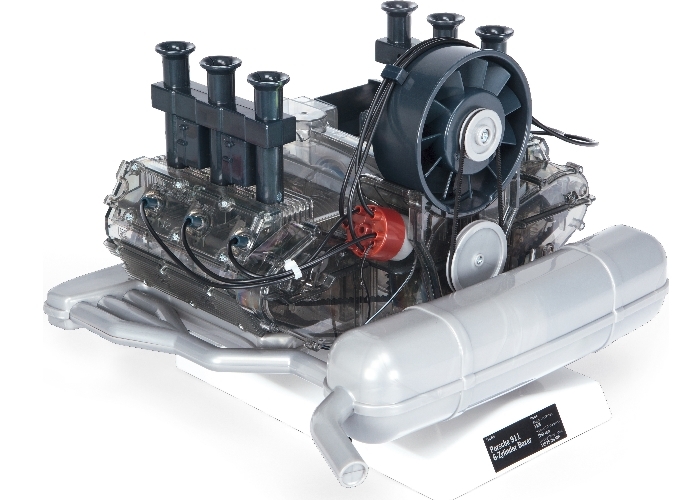 With this kit, you'll assemble a superbly detailed scale model of a 1966 2-liter flat-six engine. A precise color and quality match for your Porsche carpeting, floor mats incorporate edging and embroidered Porsche Logo. These mats fit 1985 and later models. CLICK TITLE FOR MODEL. 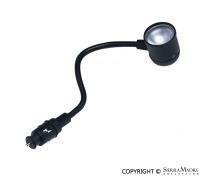 Innovative LED flash light with ring for attachment to keyring. 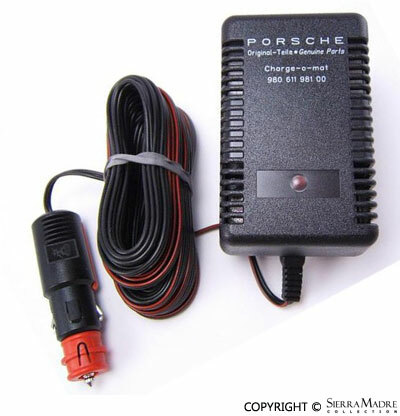 Charges via the vehicle cigarette lighter. Beach ball In MARTINI RACING colors. Soft, durable outer layer. Size: approx. 66 cm. PORSCHE and MARTINI RACING logo imprinted. CURRENTLY UNAVAILABLEIn MARTINI RACING design. 100% cotton. Extra large: (L) 200 x (W) 100 cm. Limited edition windproof, super light jacket in MARTINI RACING design. Featuring striking, sport embroidery in MARTINI RACING colors, 100% polyester. Base color: white, one size. Sporty, lightweight windbreaker made of wind-repellent material. CURRENTLY UNAVAILABLEModel car display case made of high-quality acrylic glass. Space for ten 1:43-scale vehicles. Base with Porsche logo. Available in December. 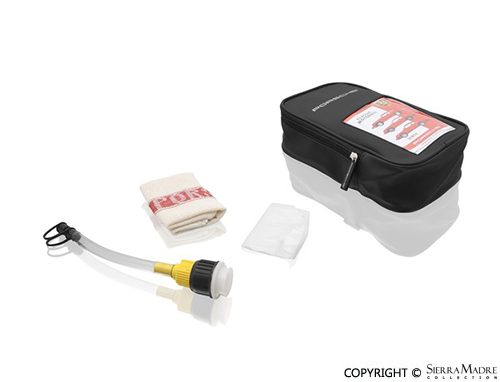 The Porsche Classic engine oil bag is used to store and transport a 1L classic oil can. Genuine Porsche® Bra! Protect your the front and the fenders with this genuine bra. Baseball Cap 75 years. Exquisitely crafted baseball cap in a muted shiny look with bi-colored bill. High class batch on front and autograph piping on bill. Silver applications on back. Metal plug with Porsche lettering. 100% polyester, lining: 100% cotton. In black. One size. Porsche® children's memory game. 36 image pairs depicting both historic and current production and racing models. Manufactured by Ravensburger. CURRENTLY UNAVAILABLEPorsche logo on the side, white piping on peak. Metal buckle with embossed Porsche logo. 100% cotton in blue, one size. 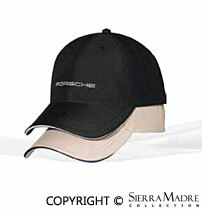 With PORSCHE® logo on the front and contrasting piping on peak. Metal buckle with embossed Porsche® logo. Made from soft outer material: 100% polyester/microfiber. Lining: 100% cotton. 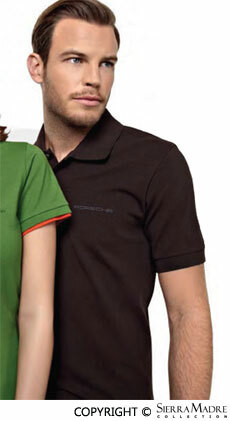 Classic red pique polo shirt, 100% cotton, embroidered Porsche logo on the chest. Set of 2 breakfast boards featuring different motifs from the Colours of 1968 collection front and back. 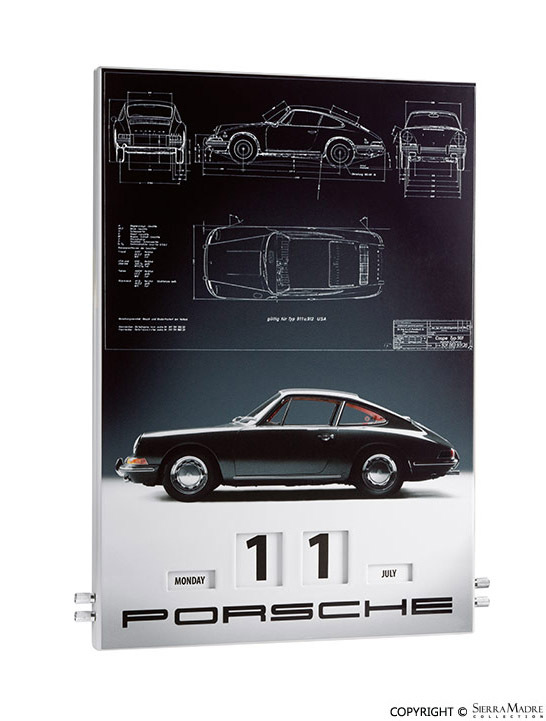 100 perforated pages featuring discreet Porsche® logo. Filing system in front section, e.g. for business cards with integrated ballpoint pen and rubber fastener. Dimensions: 6 x 7.4 inches (15 x 18.8 cm). Robust, water-proof surface made of painted truck tarpaulin with Velcro fastener. 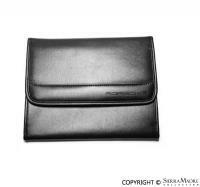 Large bill compartment, 3 credit card slots and a separate coin pouch with zipper. Dimensions: 5 x 3.5 inches (13 x 9 cm). 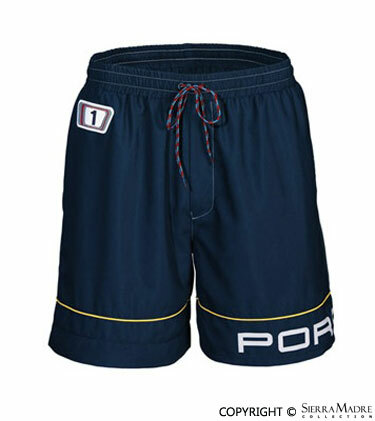 Porsche® Crest on the front and metal buckle with Porsche® logo on back. One size fits all. 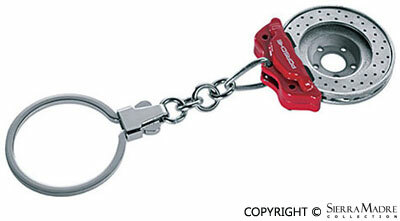 Classic key ring with Porsche® Crest. 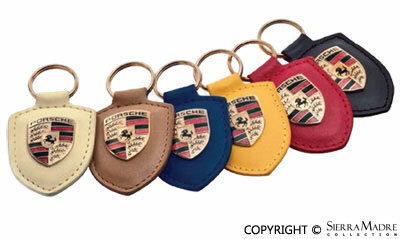 Porsche® crest leather key fob pouch. Available in Black, Marine Blue, Cashmere Beige and Classic Grey. Please choose color when placing your order. Glazed porcelain mug with gold rim and full color Porsche® crest and script. Hand wash only. With side slits, back slightly longer than front. Buttons with Porsche® Logo. 100% cotton. Sizes: S, M, L, XL, XXL, 3XL. Imported. Porsche® Design 2017 calendar. "Uncovered" with post cards and commemorative coin. 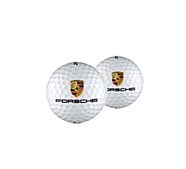 Set of 3 golf balls with Porsche® crest and logo. State of the art golf ball (Titleist NXT® Tour) 3-component design. Interlinked seam along the dimple moldings, consistently longer and accurate flight. Spin and stop control into and around the green with soft compression for outstanding feel. High-quality white bone china mug with white, grey, blue and red colored image of the 918 Spyder in the Martini Racing design. Dishwasher safe. Paper clips in the famous Porsche® 911 silhouette. Set of 100. High Quality Aluminum Sign. Includes mounting hardware (two #10 hollow wall anchors and two # 10 x 1 Phillips head truss screws). 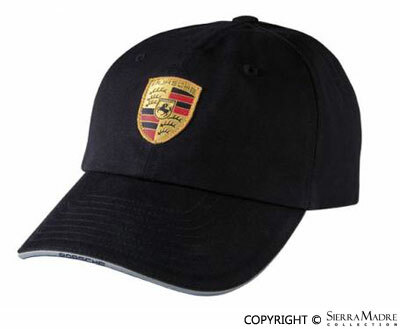 Porsche® Racing Collection baseball cap. Details in Retro Spirit design: applique on sleeve. 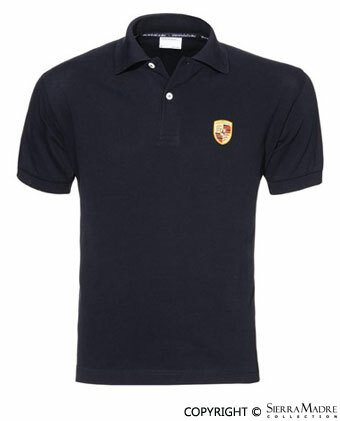 Embroidered Porsche logo on the chest, buttons with Porsche logo, neckband in checked patter. 100% cotton in patriot blue. Original racing poster from 1957 as front print, details in Retro Spirit design. Neckband in checked patter. 100% cotton. Silverguard Plus car covers are comprised of a reflective, water-resistant, 300 denier polyester outside material and soft, non-abrasive inner layer. It fits all 911, 912, 912E, 964 models without spoilet (1965-1994). Silverguard Plus car covers are comprised of a reflective, water-resistant, 300 denier polyester outside material and soft, non-abrasive inner layer. It fits all 911, 912, 930, 912E, 964 (1965-1994) models with spoiler. Silverguard Plus car covers are comprised of a reflective, water-resistant, 300 denier polyester outside material and soft, non-abrasive inner layer. It fits 993 (1995-1998) model.